I am very blessed to have a loving parents who have worked so hard to get the life they've been dreaming of. I was very creative & active when I was a child. I loved to draw and my parents enrolled me in various lessons, such as voice & piano. The most important lesson that I've learned from my childhood was to trust God no matter what. My sister passed away when I was 9 and my family & I were very devastated. However, we offered our burden & pain to God because we knew that God always has good intentions and that He always has a plan for us. 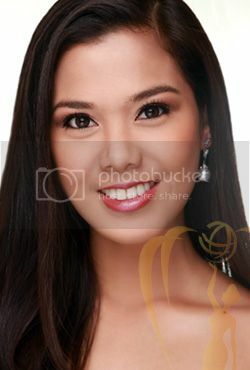 My most memorable moment was when I joined my very first pageant and won. That pageant changed my outlook in life. I used to be a shy & timid girl with very little confidence in herself. That pageant gave me the courage & conviction to pursue the person I dreamed of becoming: a more confident woman. The most unusual thing that I've ever done would was something I did when I was a child. I used to hug a tree whenever nature was calling me. My ambition in life is to follow the footsteps of my parents. They have always been my inspiration in pursuing my dreams. They started from nothing but due to their hard work, my brother & I now have a brighter future ahead of us. Like them, I want to become a hardworking, disciplined and strong woman. We should learn to conserve energy by always unplugging our appliances when not in use. This will not only save money but will also lessen the use fossil fuels that emit harmful gas in the earth's atmosphere. I chose this advocacy because people tent to neglect unplugging their appliances & they are unaware that they are wasting energy. I believe we should all start from our community and impart to them our knowledge about conserving energy. This way, they will be aware of how to save energy.